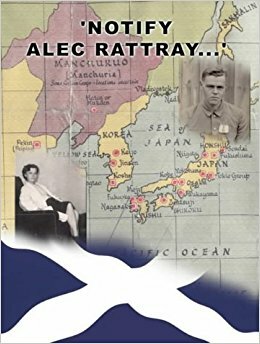 'Notify Alec Rattray……' tells of two captivities - one, a young Scottish soldier held by the Japanese in Java and Japan and the other his relatives back home in Britain. Capt. Atholl Duncan, Argyll & Sunderland Highlanders, was taken prisoner in Java in March 1942, aged 23. His fiancée, Elizabeth Glassey was a medical student at St. Andrews university. For three and a half years he was held first in Tandjong Priok in Java then Motoyama, Zentsuji and Miyata prison camps in Japan. Covering the three years 1941-43, it tells of his arrival in peacetime Singapore and events as they unfolded. Written by Meg Parkes using Atholl’s secret diaries and their correspondence, she lets them tell their story in their own words. The book contains dozens of illustrations - photographs, maps, drawings, cards, letters, documents and even lists of names and addresses of fellow prisoners. 'Notify Alec Rattray…..' will be invaluable to those who are searching for information about their relatives who were prisoners of war in the Far East. Fully indexed with a foreword is written by Major (Retd) Alastair Campbell A&SH. Discount price of £10 for COFEPOW members plus p&p.